Photo by Corey Hendrickson Weddings at Sugarbush Resort in Warren, Vermont. Should You Do A First Look On Your Wedding Day? A First Look is such a personal decision for our couples. It's wrapped up in all sorts of emotion, traditions and even superstitions. But wait, what is a First Look? A First Look is a relatively new practice that I believe was born out of a desire to have more time on your wedding day. It usually happens a few hours before your ceremony. It's a moment created by your photographer and/or cinematographer when the couple see each other for the first time fully dressed in their wedding day attire. This moment can be private, just the two of you, or include family or the bridal party. I find they work best when done privately... more on those reasons below. Photo by Jennifer Mardus Photography. Before I jump into my reasons to consider a First Look, listed below, I should say that this is a very personal decision to be made by you and your partner. After reading my reasons back I realized that I sound pretty intense... but really, if you decide to not do a First Look, I'm OK with that. It is your day. But before you make that decision let's get together and chat about the day and how it will unfold. After chatting, if that day sounds perfect to you, then we will go for it. More than anything, I want you to be happy with the decision... to First Look or Not to First Look. 1. It gives you an intimate, private moment to be together. A First Look gives you both some time to show your true genuine emotion, to let your guard down, and not be worried about the 100+ guests looking at you as you see each other for the first time. It's a beautiful chance to connect after your busy morning of getting ready and before the rest of the day unfolds. And, this is 'your person' he or she will calm your nerves when they look into your eyes and they give you a big hug at that First Look. I've definitely been told by my couples over the years that they felt so much more relaxed after seeing each other. 3. Photos. Besides getting all the images you want as a couple, you'll have plenty of time to get bridal party and family photos before the ceremony. Family photos require us getting everyone together and this is not an easy task post ceremony. We are always out chasing down that one family member who decided to hit the bar real quick on his way to photos and was stopped three times to chat with family members on his way back.... And of course this would happen, everyone is so happy to be together and celebrate, it makes perfect sense! But photos must wait for them to get to the photo area. The first look really just opens the day up so that we can then schedule in most group photos before the ceremony too. We would usually plan on about 30 minutes to one hour, depending on the size of your group. These images would happen post-First Look but pre-ceremony. 4. Family and Friends. The guests at your wedding are the most important in your life and you will want to spend time with them on that day. 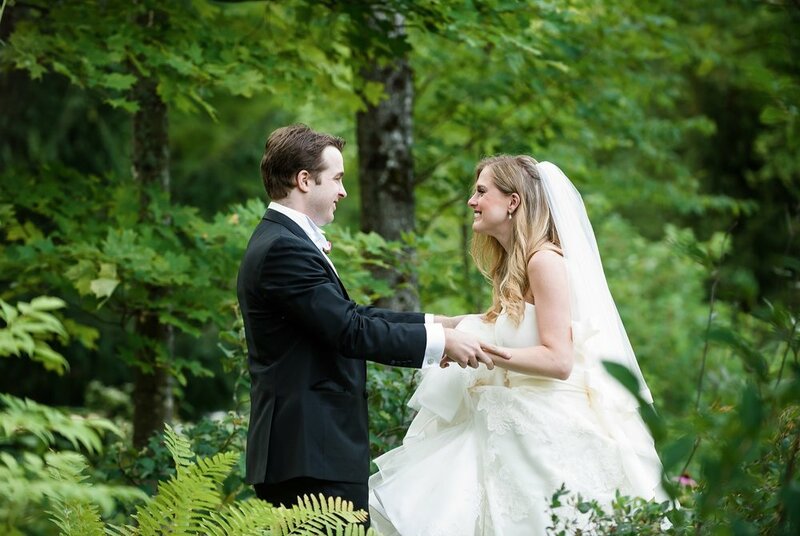 Most of our weddings here in Vermont are destination events for our couple and the guests. Often your guests have traveled some distance to get to your wedding. Your gift to them, the way to show them appreciation for coming all that way on that day, is your time. The first look really opens up your time post ceremony. The first look will give you time to enjoy your guests during cocktails too. You might find you and your photographer decide to use 20 minutes of your cocktail hour for a few more shots but this is so much better than not making it at all and often all images are complete at this point in the day. Photo by North Photography at the Grand Isle Lake House in Grand Isle, Vermont. I reached out to a few wedding friends on this topic too. All made very similar points but one stood out in the crowd. Our friend Amanda from Orchard Cove Photography had a great blog post written about this exact topic with a very unique perspective... bride and photographer. I especially love her tips on how to make the First Look happen. We can go through all of those details together if you decide you do want to do a First Look on your wedding day. Check out her blog post with all those tips and fantastic images of her own First Look on the shores of Lake Champlain. So again, whatever you decide, to First Look or Not to First Look, we are here to support you! Let's chat about this soon!